The second generation A-New system, MOD 2 (ground simulator) and MOD 3 (avionics system), incorporated a number of technical and operational improvements such as an improved TACO (TActical COordinator) display and display consoles using cathode ray tubes instead of electro-mechanical displays. Because the A-New system gets much of its increased capability from the use of a digital computer, the MOD 3 system was enhanced by the new prototype Univac 1830 computer, replacing the older machine used in the MOD 1. The 1830, designated CP-823/U by the Navy is a high-speed parallel machine, built almost entirely from semiconductor microcircuits. The machine is designed to use a modular memory, available in increments of 4,096 words, up to a total of 32,768 words. This is considerably larger capacity than the MOD 1 computer and the CP-823/U operates at a higher speed, with a memory cycle time of 4 microseconds and an add/subtract time of 8 microseconds. The A-NEW MOD3 ASW system has been mentioned throughout this site, mostly pertaining to computer engineering. Project A-New MOD 3 was the final testbed avionics prototype, interfacing the CP-823/U Computing System with the many sensors and sensor stations and Tactical Command in the P-3 Orion test aircraft. Operation is centered around the digital computer. The computer is responsible for integrating the inputs received from various ASW sensors, determining the optimum tactics to employ, executing the tactic, computing the probability of success or failure, and navigating the aircraft.Some of the A-New programs include: Navigation, Search and Correlation, Contact Conversion, Automatic Tracking, Extend Tracking, Identification, Attack, Post Flight Analysis. The Univac 1830, Navy designated CP-823/U, is a digital electronic computing machine which receives problems and data and processes answers in numerical form. It uses parallel binary arithmetic and logic operations; word length is 30 bits. All of the Central Processor (C.P.) logic and I/O logic control is microelectronic circuitry, constructed of integrated, monolithic semiconductor elements (resistors, diodes and transistors contained within a single chip of silicon). 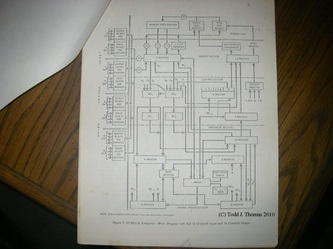 Logic cards that are not microelectronic are the Master Clock cards in the C.P and the Input amplifier and output data driver cards in the I/O units. The MOD 3 system also used the Charactron Display consoles being developed by General Dynamics Stromberg-Carlson Div., Dunlap & Associates for human engineering in systems hardware, Loral Corp. for interface hardware between displays, computer and sensors, Lockheed and Grumman for the ASW aircraft and studies pertaining to aircraft integration. The Central Processor (CP) unit of the Univac 1830 / CP-823/U MOD3 prototype digital computing system contains all the logic for arithmetic, computer control and memory access control. Figure 1 illustrates registers, basic translation networks and communication paths within the central processor. (Any redundancy is due to the similarity of the various sources or time frames).